Are we too close to Easter for me to be posting another chocolate recipe? Or are you riding a wave of sugary goodness – the week a write off for those whose overindulgence spilled over into Monday, the rest of the year a free for all for those who gave up chocolate for Lent? Let’s just say that wherever you sit on the chocolate-guilt-joy spectrum at this current moment in time, this recipe is one worth filing away for the future. These blondies are good. 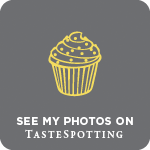 Search through the blog archives and you’ll find that blondies are a bit of an obsession of mine. 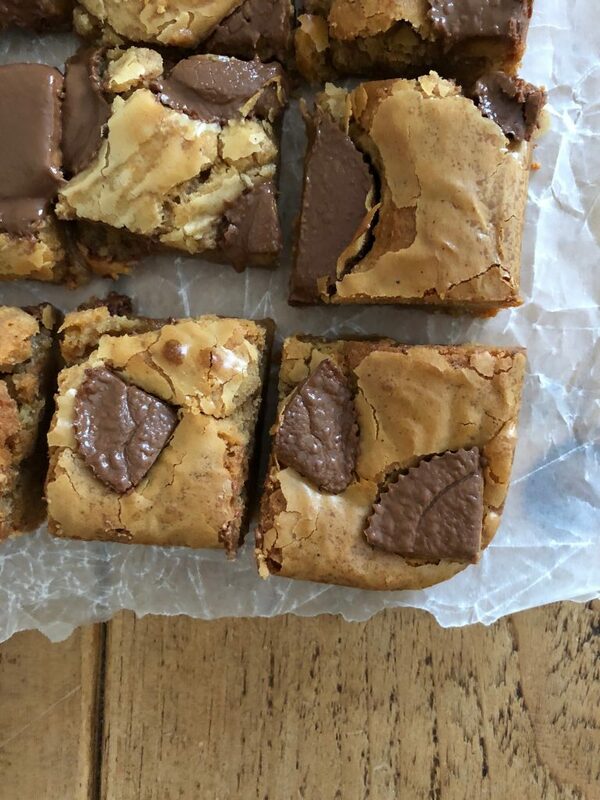 After brownies, ice cream and cookies, blondies are probably the go-to dessert I make most often if we’re stopping in on Saturday night for a film, pizza, pajama sort of vibe (which, let’s face it, is most Saturdays when you’re parent to a toddler). 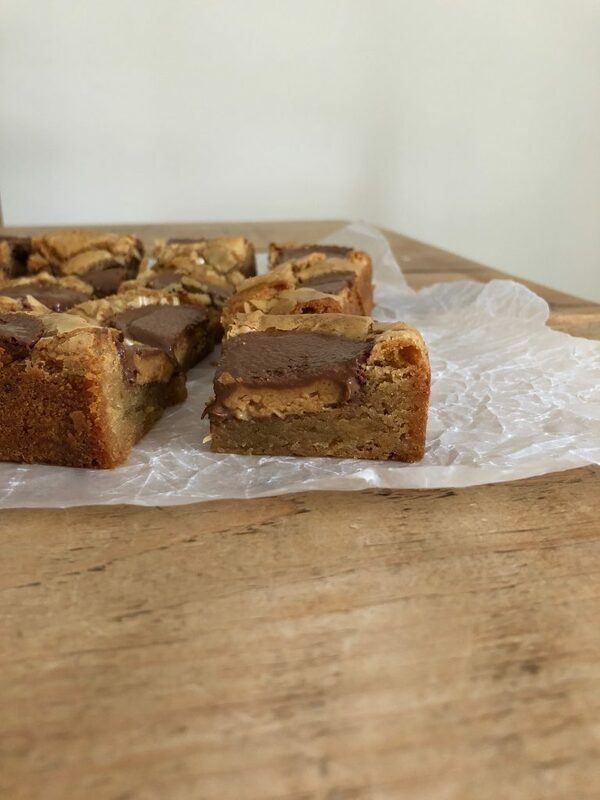 Although a blonde bar can be the perfect excuse to escape from chocolate altogether, they also work beautifully with and here we’re mixing melted white with chunks of peanut butter cup and a sprinkle of sea salt for perfect mouthfuls of sweet and salty squidge. 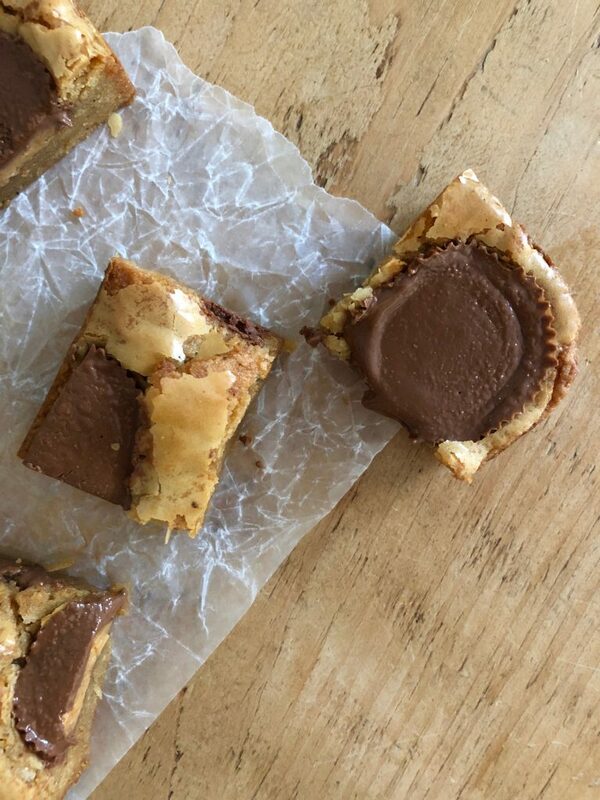 Crackly-topped, fudgy-middled blondies stuffed with peanut butter cups. Delicious served warm with cold vanilla ice cream. Grease and line a 20cm square baking tin with baking parchment. Preheat the oven to 180 C/160 C fan. In a medium bowl, whisk together the flour, baking powder and salt. In a separate bowl, whisk together the eggs, sugars and vanilla until pale and light, then whisk in the cooled butter-chocolate mixture. Fold in the flour, then scrape the mixture into your prepared tin. Sprinkle with sea salt. 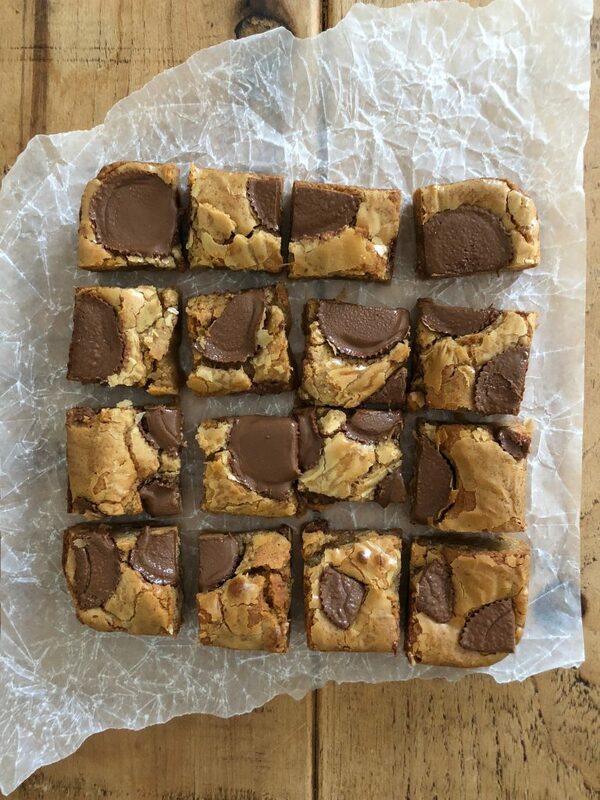 Bake the blondies for 25 minutes, then remove from the oven and press in the peanut butter cups. Return to the oven for 3 - 5 minutes, until lightly golden on top and fudgy and dense in the middle. You’re aiming for a brownie, rather than a cake-like texture, so a skewer inserted in the middle will come out slightly sticky. 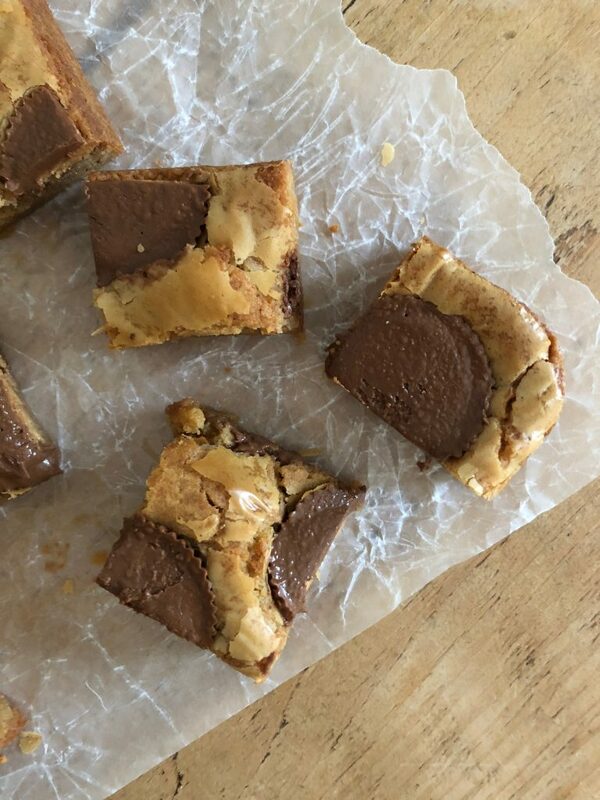 Allow the blondies to cool completely then remove from the tin and slice into 16 squares. Will keep in an airtight container for several days and also freeze well. Any tips on making a gluten free version of this please? I tried the half and half and it worked really well! Didn’t even feel like a gluten free version… Thanks!